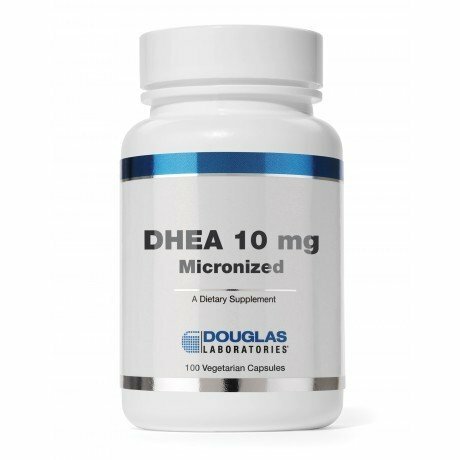 DHEA 10 mg capsules, provided by Douglas Laboratories, contain highest purity micronized dehydroepiandrosterone (DHEA) produced under strict Good Manufacturing Practices (GMP) standards. DHEA is a natural steroid hormone that is synthesized from cholesterol through pregnenolone by the adrenal glands. DHEA acts as an antagonist for glucocorticosteroid hormones and is the parent precursor for other important steroid hormones, such as estradiol and other estrogens, and testosterone. While not a precursor to progesterone, DHEA can indirectly influence progesterone synthesis through a feedback mechanism whereby pregnenolone is converted to progesterone based on DHEA levels. Apart from these functions, DHEA also has important biological functions itself. Recent experimental and human studies show that DHEA is involved in a large variety of physiological processes, including immune function, brain function, bone metabolism, blood lipid metabolism, energy metabolism, the regulation of normal blood sugar and insulin levels, and the maintenance of lean body mass. DHEA and its metabolite DHEA sulfate are present in human adult plasma in concentrations of 0.01-0.02 µM and 5 to 7 µM, respectively. DHEA sulfate levels are low in early childhood and begin to rise after age 7, peak at age 20-24, and then drop at a rate of approximately 20% per decade, until at age 85-90, levels are 10-15% of what they used to be at age 20-30. DHEA levels also decline under a variety of conditions of physiological stress, such as acute and chronic infections, and trauma. Vegetarians have been shown to have decreased DHEA levels as well. DHEA capsules may be a useful nutritional adjunct for individuals who wish to support the body’s normal DHEA functions. Araneo B, Daynes R. Endocrinology 1995;136:393-401. Araneo BA, Shelby J, Li GZ, Ku W, Daynes RA. Arch Surg 1993;128:318-25. Azuma T, Nagai Y, Saito T, Funauchi M, Matsubara T, Sakoda S. J Neurol Sci 1999;162:69-73. Berdanier CD, Parente JA, Jr., McIntosh MK. Faseb J 1993;7:414-9. De Pergola G, et al. Int J Obes Relat Metab Disord 1994;18:659-64. De Pergola G, et al. Int J Obes Relat Metab Disord 1996;20:1105-10. Eich DM, et al. Circulation 1993;87:261-9. Evans TG, Judd ME, Dowell T, Poe S, Daynes RA, Araneo BA. Vaccine 1996;14:1531-7. Flynn MA, Weaver-Osterholtz D, Sharpe-Timms KL, Allen S, Krause G. J Clin Endocrinol Metab 1999;84:1527-33. Garcia-Estrada J, Luquin S, Fernandez AM, Garcia-Segura LM. Int J Dev Neurosci 1999;17:145-51. Glaser JL, et al. J Behav Med 1992;15:327-41. Hall GM, Perry LA, Spector TD. Ann Rheum Dis 1993;52:211-4. Jesse RL, Loesser K, Eich DM, Qian YZ, Hess ML, Nestler JE. Ann N Y Acad Sci 1995;774:281-90. Katz S, Morales AJ. Semin Reprod Endocrinol 1998;16:161-70. Lee J, et al. Alcohol Clin Exp Res 1999;23:856-62. Legrain S, et al. Gerontology 1995;41:343-51. Morales AJ, Haubrich RH, Hwang JY, Asakura H, Yen SS. Clin Endocrinol (Oxf) 1998;49:421-32. Morales AJ, Nolan JJ, Nelson JC, Yen SS. J Clin Endocrinol Metab 1995 Sep;80(9):2799]. J Clin Endocrinol Metab 1994;78:1360-7. Nestler JE, Clore JN, Blackard WG. Faseb J 1992;6:3073-5. van Vollenhoven RF, Park JL, Genovese MC, West JP, McGuire JL. Lupus 1999;8:181-7. Wolkowitz OM, Reus VI, Keebler A, Nelson N, Friedland M, Brizendine L, Roberts E. Am J Psychiatry 1999;156:646-9. Yu CK, Yang BC, Lei HY, Chen YC, Liu YH, Chen CC, Liu CW. Clin Exp Allergy 1999;29:414-22.